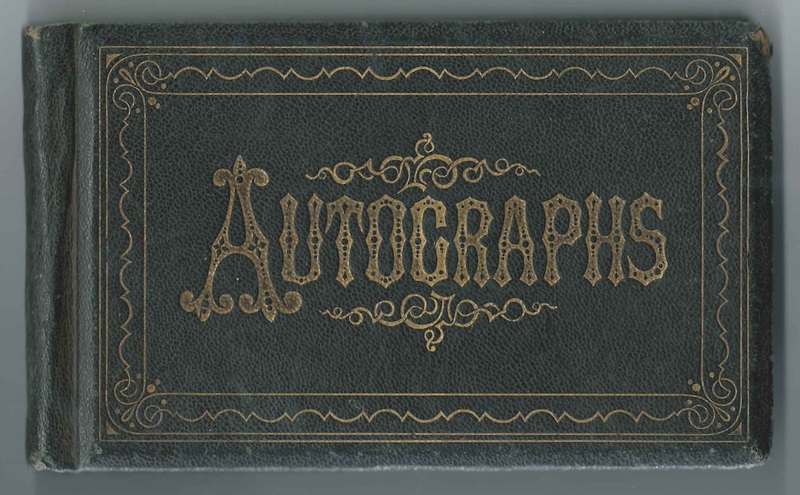 1870s autograph album of Clara Caroline Mitchell of Canton, Maine, and Auburn, Maine. She married William R. McGibbon, a New Brunswick native, in the late 1870s. Clara didn't leave an inscription, but various clues, including a page inscribed by her husband William R. McGibbon on January 11, 1880, were instrumental in identifying the owner. The album measures approximately 7" by 4" and contains the sentiments of at least 68 of Clara's relatives and friends. An alphabetical surname list and an alphabetical list of the inscribers, together with any personal information they offered, appear at the end of this post. According to Descendants of William Shurtleff of Plymouth and Marshfield, Massachusetts, Volume 1, by Nathaniel Bradstreet Shurtleff and published in 1912, Clara Caroline Mitchell was born May 26, 1852 at Canton, Maine, the daughter of Hiram Clark Mitchell and Joanna Cobb (Baird) Mitchell. Although the initial is ornate, I believe that Clara's brother Walter C. Mitchell inscribed a page at Canton, Maine, on February 19, 1875. 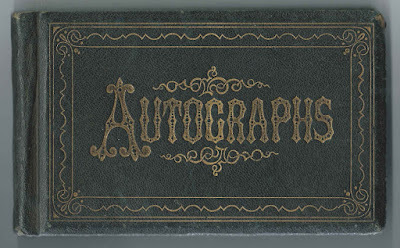 Caddie Ellis inscribed a page at Canton, Maine, on February 21, 1877. She was presumably Caroline Mitchell (Brett), wife of Hiram Clinton Ellis. 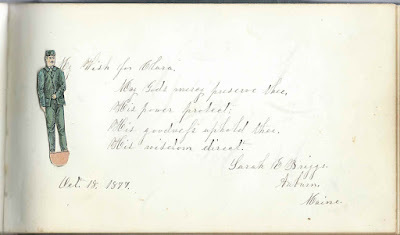 Jennie Brett inscribed a page at Canton, Maine, on February 21, 1877. 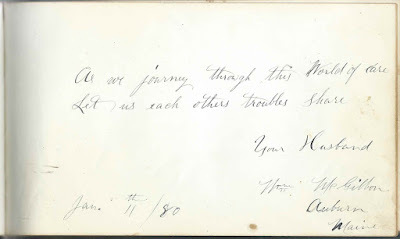 Clara and William may have married in 1878, as several of William's relatives inscribed pages in December of that year, presumably at the wedding or during a visit that Clara and William made to the McGibbon home in Moore's Mills, New Brunswick or during a visit that the relatives made to Maine. William's previous wife, Jennie N. (Randlett) McGibbon, had died in 1877. Clara died in 1926 and William in 1930. They're buried in the Oak Hill Cemetery at Auburn, Maine, with their daughter Nellie who died in 1933. The page inscribed on October 18, 1877 by Sarah E. Briggs of Auburn, Maine, has a paper doll of a uniformed man tucked in, but I don't know if the doll was initially inserted there by Sarah or not. E. Jarvis Baker of Boston, Massachusetts. He was Edward Jarvis Baker, born September 8, 1843 at Dorchester, Massachusetts, son of James and Harriet D. Baker, and husband of Emilie Rutton (Coolidge) Baker, who inscribed the subsequent page. They married at Dorchester, Massachusetts, on April 24, 1867. Emilie C. Baker of Boston, Massachusetts. She was Emilie Rutton (Coolidge) Baker, born about 1837, daughter of Jacob and Joanna Coolidge and wife of Edward Jarvis Baker, who inscribed the preceding page. Emilie and Edward Jarvis Baker married at Dorchester, Massachusetts, on April 24, 1867. Abbie F. Bosworth of Canton, Maine, inscribed on February 28, 1875. Shared the page with Walter C. Stetson, whom she would marry at Hebron, Maine, on August 26, 1876. Jennie Brett of Canton, Maine, inscribed on February 21, 1877. Jennie May Brett, sister of Caroline Mitchell (Brett) Ellis, who may have been inscriber Caddie Ellis. Jennie's mother, Julia Ann (Mitchell) Brett and album owner Clara Caroline Mitchell's father, Hiram Clark Mitchell, were siblings. Sarah E. Briggs of Auburn, Maine, inscribed on October 18, 1877. Whether random or not, there's a paper doll of a man in what appears to be a railway uniform tucked in this page. Mrs. Hattie Brown of Maine Central House, Lisbon Falls, Maine. The Maine Central House was built at Lisbon Falls, Maine, by the Maine Central Railroad. Lue E. Dwinal, or possibly Sue E. Dwinal, inscribed at Auburn, Maine, on April 25, 1875. Presumably Lucia Ellen (Hawks or Hawkes) Dwinal, who died at Auburn, Maine, in 1878. She was the daughter of Edward Gould Hawks or Hawkes and Harriet (Lovell) Hawkes and the wife of Harrison J. Dwinal. 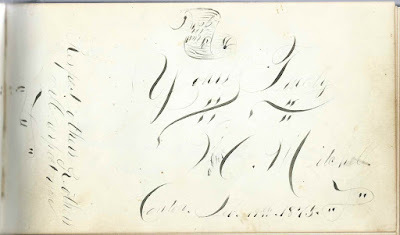 Lue inscribed another page, and her husband Harrison inscribed the facing page. H. J. Dwinal of Auburn, Maine, inscribed on April 25, 1875. Presumably Harrison J. Dwinal, whose wife Lucia Ellen (Hawks or Hawkes) Dwinal inscribed the left facing page. Caddie Ellis, inscribed at Canton, Maine, on February 21, 1877; Clara's cousin. Possibly Caroline Mitchell (Brett) Ellis, wife of Hiram Clinton Ellis. Caroline's mother, Julia Ann (Mitchell) Brett and Clara's father, Hiram Clark Mitchell, were siblings. 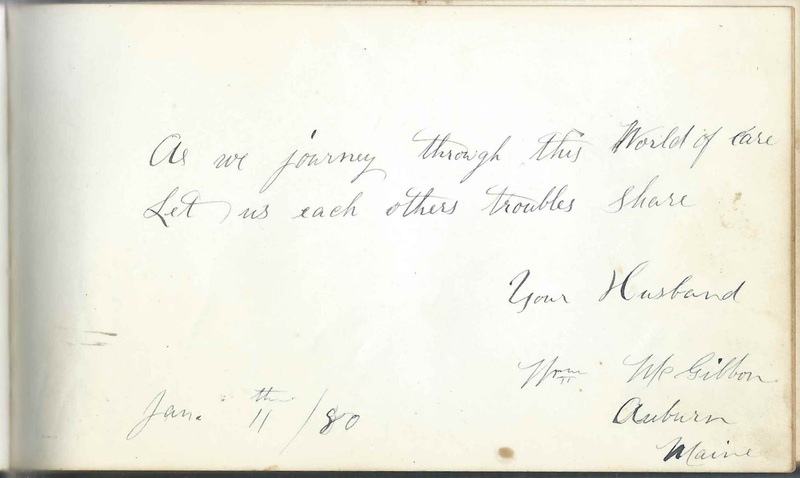 Caroline sister Jennie Brett also inscribed a page. Mrs. E. M. Gammon of Auburn, Maine, inscribed on September 10, 1873. Elizabeth Mary (Bisbee) Gammon, mother of inscriber Alfred T. Gammon. H. C. Harlow of Auburn, Maine, inscribed on June 28, 1873. Perhaps Hannah C. Harlow; if so, the L. D. Harlow who inscribed the facing page was her sister Lydia D. Harlow. L. D. Harlow of Auburn, Maine, inscribed on June 28, 1873. Perhaps Lydia D. Harlow; if so, the H. C. Harlow who inscribed the left facing page was her sister Hannah C. Harlow. Lulu Littlefield of Lisbon Falls, Maine; "Your Friend at the Maine Central House". The Maine Central House was built at Lisbon Falls, Maine, by the Maine Central Railroad. 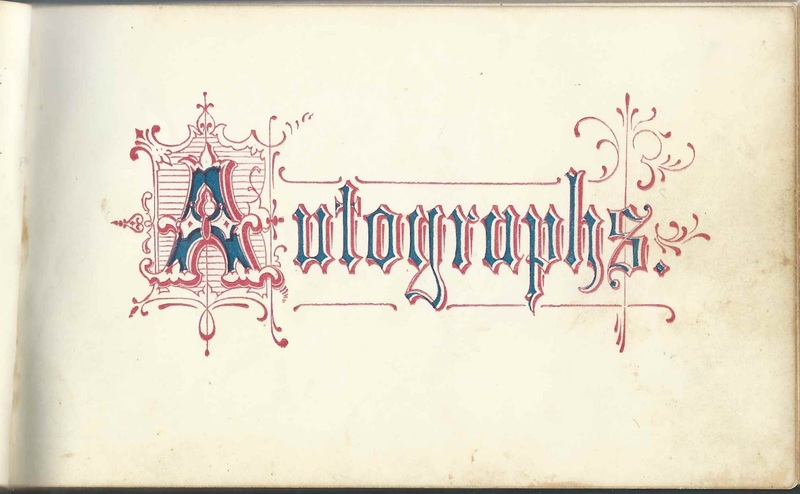 William McGibbon of Auburn, Maine, inscribed on January 11, 1880; "Your Husband". Clara Caroline Mitchell, album owner, was the second wife of William Robert McGibbon (1847-1930), whose first wife, Jennie N. (Randlett) McGibbon, died in 1877. John McGibbon of Moore's Mills, New Brunswick, inscribed on December 29, 1878; presumably the younger brother of album owner Clara's husband William R. McGibbon and possibly inscribed around the time of their wedding. John's sister Emma inscribed the right facing page. Emma McGibbon of Moore's Mills, New Brunswick, inscribed on December 29, 1878; presumably Emma was the younger sister of album owner's Clara's husband William R. McGibbon, possibly written around the time of their wedding. Emma's brother John inscribed the left facing page. Clara Caroline Mitchell of Canton, Maine, and Auburn, Maine; album owner. She would marry William R. McGibbon, a New Brunswick native, in the late 1870s. Walter C. Mitchell, inscribed at Canton, Maine, on February 19, 1875. Walter Clark Mitchell (born February 7, 1855) was album owner Clara's brother. Annie A. Munroe of Auburn, Maine, inscribed on April 25, 1875; she was presumably the same Annie A. Munroe who inscribed the right facing page. G. T. Pike, inscribed on August 10, 1875; not sure of initials. George T. Pike; his wife Catherine Elizabeth. (Stevens), "Kate", inscribed the right facing page. Kate E. Pike, inscribed at Auburn, Maine, on August 10, 1875. 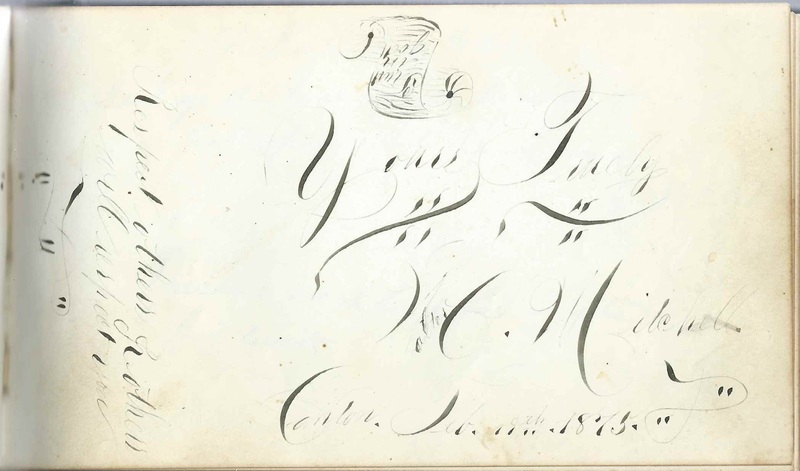 She was Catherine Elizabeth Stevens, "Kate", whose husband, George T. Pike, inscribed the left facing page. J. M. Rich, inscribed at Auburn, Maine, on August 8, 1875. Perhaps Jennie M. (Stowell) Rich, wife of Royal F. Rich. I. S. Robinson, inscribed at Auburn, Maine, on June 6, 187x [possibly 1875]. He was Isaac S. Robinson, husband of Cordelia Austin (Shackley) Robinson, with whom he shared the page. W. C. Stetson of Canton, Maine; Walter C. Stetson. Shared the page with Abbie F. Bosworth, whom he would marry at Hebron, Maine, on August 26, 1876. D. S. Weston, inscribed on May 3, 1875. Presumably Dorcas S. (Chamberlain) Weston, wife of Henry C. Weston, who inscribed the following page, as did her brother Rufus E. Chamberlain, then living in Bermuda. Hattie L. Weston of Auburn, Maine; no date entered. Shared the page with D. S. Weston. Dorcas S. (Chamberlain) Weston and Henry C. Weston had a daughter Hattie L. Weston, but she would have been only about age 5 in 1875. If written in 1875, her mother may have written in her name, or perhaps Hattie added her name to the page later. Henry C. Weston of Auburn, Maine, inscribed on May 2, 1875. He shared the page with R. E. Chamberlain, presumably Rufus E. Chamberlain, brother of Henry's wife Dorcas S. (Chamberlain) Weston, who inscribed the previous page.